Q: Is air conditioning available for Elite? A: Yes, a "CoolCat" 2 in 1 AC/Heat Pump unit is available for Elite as an optional feature. The unit is integrated into the cabinet in the trailer with matching color. Q: Is a refrigerator available for Elite? A: Yes, a 1.90 CF refrigerator is a standard feature for Elite. Q: Is a LP furnace available for Elite? A: The Elite support an optional factory installed 12,000 BTU furnace with thermostat and fan. Q: Is a bathroom available on Elite? A: A fully function bathroom is a standard feature for Elite. The bathroom is equipped with shower, washbasin, mirror, cabinet and toilet. Q: Does the Elite have a holding tanks? A: Elite is equipped with a 22 gal fresh water tank and a 14 gal grey water tank. The toilet has its own holding tank. Q: What types of cars and trucks can pull the Elite? How much does it weight? A: The Elite is a very lightweight and diminutive size allows it to be towed by a wider range of vehicles than most any other trailers of this class. In fact, the Elites dry weight is only 2366 lbs and easy to maneuverable around by hand. Most light trucks and SUV's can easily handle the Elite. In addition, many mini van and passenger cars can also pull the Elite. You need to double check your tow rating by consulting the vehicle owners' manual or call your car dealership and ask for the tow capacity of your vehicles. The Dry Weight is the weight of the trailer without options or cargo. Make sure you take into account these factors so you do not overload the trailer or exceed the tow rating of your vehicle. Q: What kind of hitch should I use for Elite? A: We recommend using a Class 2 hitch with load equalizing bars for most vehicles (not necessary on heavy trucks). The load equalizing bars transfer weight to balance the load between the front and rear wheels, which is necessary to level the vehicle and keep proper front end alignment on the tow vehicle. Q: What is the warranty on iCamp? 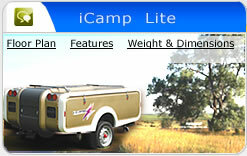 A: All iCamps included a one year "Bumper to Hitch" limited warranty. Structural components are covered by a two year limited warranty. Many accessories and components have warranties from the original equipment manufacturer. Q: Can I buy direct? A: No. 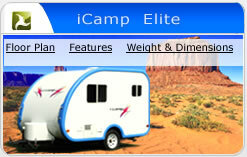 iCamp is marketed through a nationwide network of independent recreational vehicle dealerships. Your dealer offers you valuable services including financing, trailer service, parts and accessory sales. Just click the "Dealer Locator" link and locate the closest dealers in your area, or call URV at 201-498-0999 for more dealer information. Q: How do I find my local dealer? 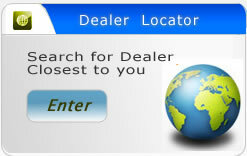 A: Just click the "Dealer Locator" link and locate the closest dealers in your area, or call URV at 201-498-0999 for more dealer information. Thank you for stopping by our website and we hope you decide to choose an iCamp for your future camping needs and enjoyment!